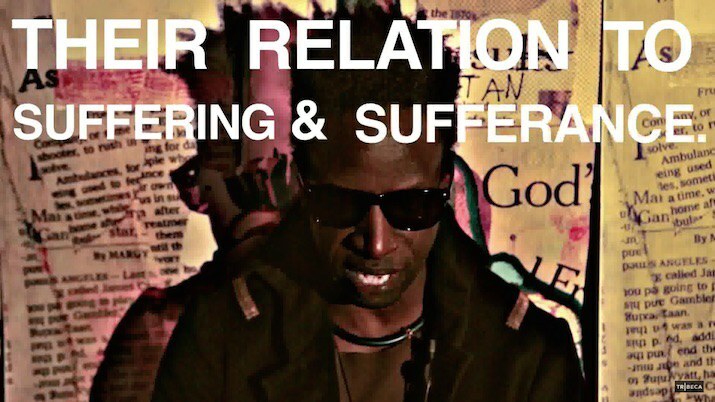 Saul Williams speaks about the Central African influences on his latest LP 'Martyr Loser King' and releases "Coltan as Cotton" video poem. Multifaceted poet, actor, activist and musician Saul Williams, shares "Coltan as Cotton", the first in a series of video poems he'll be releasing to accompany his album Martyr Loser King, a project in which Williams presents a global conversation between "one percenters" and the rest of the world through the lens of a fictional computer hacker from Burundi. "Coltan as Cotton" is a spacey call-to action, which sees the poet fiercely delivering lines against a staticky, computerized backdrop as the poem's lyrics flash briskly across the screen. Williams spoke about the meaning behind the poem in an interview with FACT, "coltan is a precious stone that is found in Central Africa, China and Russia, roughly the same places you find diamonds. It is what distributes power in our cell phones and laptops. As you can imagine, the stories around those coltan mines have a direct lineage to the stories of rubber, sugar cane, iron, oil, gold, diamonds. We know how those companies become rich: by exploiting natural resources, usually in the third world, and how the power breaks down. This is a stone that distributes power, like the distribution of wealth. I’m holding it in my hand as I talk to you on my iPhone — we all have it... the question is, how do we break the cycle?... The poem is simply things to ponder, things to question, things we need to be thinking about as we step through life." The outspoken artist also spoke with FACT about the Central African influences on his album, "It has everything to do with the interface between traditional, polyrhythmic music — the music that comes from Central Africa — and the digital. With polyrhythmic music, there aren’t many strings, and you’re dealing with minimalism and repetition, but the way that they’re placed over each other, it feels like a vortex — a trance. What I’m looking for is the quickest way to evoke that trance-like medium, breaking that “sound barrier” that allows you to escape the exterior world and go deep, immediately." Watch the poet-musician's zealous performance in "Calton as Cotton" below. For more on Saul Williams, revisit his previous single "Burundi."